Figure 35.14. ΣFLC concentrations in various liver diseases, corrected for renal function (using cystatin C). Broken lines show values for non-liver disease patients with normal renal function (blue: median value; red: 95% upper limit). (Reprinted from  with permission from EASL). Figure 35.15. Alcoholic liver disease risk stratification model incorporating MELD and cFLC. Risk factors were cFLC >50mg/L or MELD >11. (Courtesy of D. Adams). Chronic viral infection is a significant cause of elevated polyclonal immunoglobulins and sFLCs. Chronic hepatitis C virus (HCV) infection is also associated with the development of B-cell disorders including mixed cryoglobulinaemia (MC) and B-cell NHL . Patients with HCV-related MC are at a 35-fold increased risk of lymphoproliferative disease compared with the general population . Terrier et al. studied 59 patients with HCV infections and MC. The results showed elevated sFLCs in nearly 50% of patients. Furthermore, mean polyclonal sFLC concentrations progressively increased with worsening disease category (p<0.001) and increasing cryoglobulin concentrations (p<0.0001). Ten patients had an abnormal κ/λ ratio at baseline, and changes in the ratio correlated with the virological response to HCV treatment. The authors speculated that following antiviral therapy, the κ/λ sFLC ratio was a surrogate marker of the control of HCV-related lymphoproliferation. Basile et al. reported that an abnormal κ/λ sFLC ratio at baseline was associated with no/partial response to Rituximab therapy in HCV-infected MC patients (p=0.03), and speculated that pre-treatment assessment of the sFLC ratio may be useful to predict response. A subsequent study by Terrier et al. included 155 HCV-infected patients and compared sFLC and IgM Hevylite® (HLC) measurements in the following four groups: 1) no MC; 2) asymptomatic MC; 3) MC vasculitis; and 4) MC vasculitis with B-cell NHL. On univariate analysis, the κ/λ sFLC ratio and IgMκ/IgMλ HLC ratio were significantly different between the groups (both p<0.0001). However, in multiparametric analysis (including a total of 7 serum biomarkers), neither the sFLC ratio nor IgM HLC ratio remained significantly different between patients with and without overt B-cell NHL. No data on the FLC or HLC concentrations was provided. 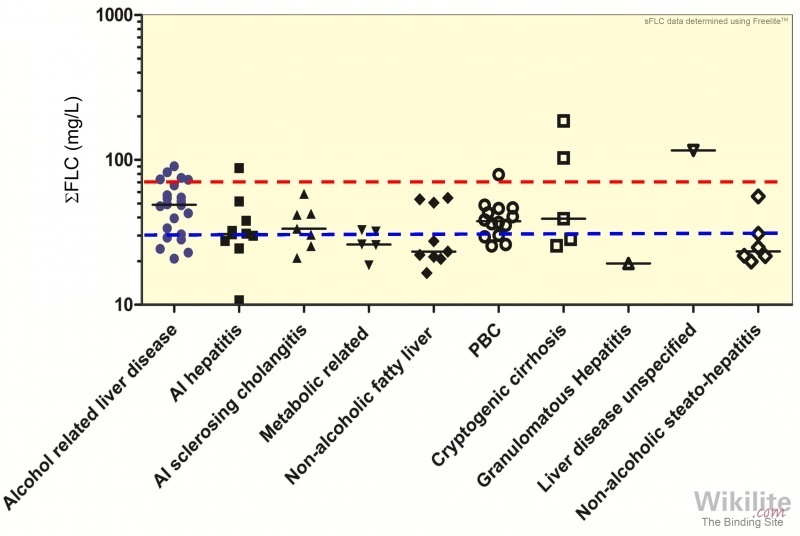 Analysis of sera from 80 patients with chronic liver disease of mixed aetiology revealed higher than normal ΣFLC concentrations . After correction for renal function, patients with alcoholic liver disease exhibited the most consistent elevations (Figure 35.14), indicative of increased FLC production and also demonstrating the importance of accounting for renal function when interpreting FLC results (Section 6.3). Developing this line of investigation further, Faint et al  measured combined sFLC concentrations in sera from 340 patients with alcoholic liver disease using a new turbidimetric assay (Combylite, cFLC) . 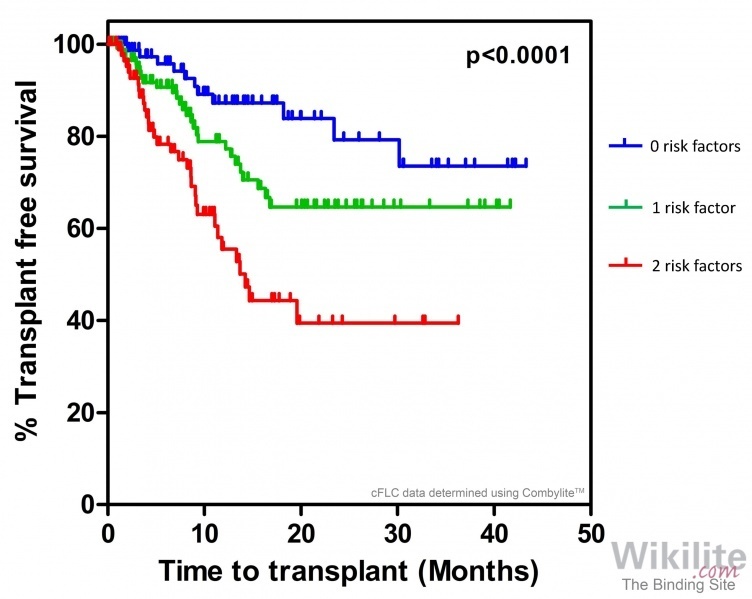 Addition of cFLC to an accepted risk stratification calculation (Model for End-stage Liver Disease; MELD) improved the prediction of time to transplant (Figure 35.15). Teng et al. determined that adding sFLC or albumin measurements to that of alpha-fetoprotein would improve the diagnosis of hepatocellular carcinoma. While albumin measurement would appear to be the simplest choice for diagnostic purposes, the authors considered that sFLC elevation probably reflected the developing B-cell response to viral infection and that further study was merited to investigate the role and potential utility of sFLC measurement.